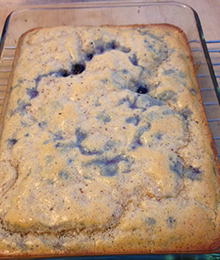 Dr. Beth's Gluten-Free Blueberry Almond Cake - Sugar Free Also!! Melt a teaspoon of coconut oil in a medium baking dish (4 x 6 or a loaf pan) - spread around to coat bottom and sides. Place eggs in large bowl and beat with electric mixer until pale and fluffy. About 4 to 5 minutes. Gently stir in remaining ingredients except for blueberries. Add part of the batter to the pan and sprinkle with 1/2 of the blueberries on top. Add another layer of batter and berries until gone. Bake for about 25 (4 x 6 pan) to 35 minutes (loaf pan) until it passes the toothpick test. Cool on wire rack. So easy, healthy and DELICIOUS!!! !